The Irish Grand National is Ireland’s most valuable chase and traditionally takes place at Fairyhouse on Easter Monday over a race-distance of 3m 5f and includes 24 fences. Some excellent horses are entered this year thanks to a prize-fund of €500,000! 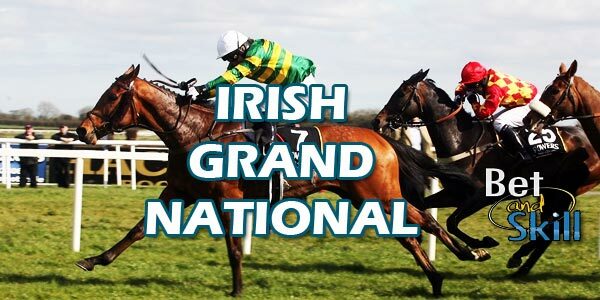 Find here our Irish Grand National betting preview with tips, predictions, best odds, bookmakers offers and no deposit free bets! OUR DUKE is the ante-post favourite of the race. He recently the Group 1 Neville Hotels Novice Chase at Leopardstown beating Coney Island by half-a-length despite making a bad mistake at the 11th fence. Then he finished runner-up to the highly-rated Disko in the Flogas Novice Chase at the same racecourse. He was unsuited by the way the race developed there and will prove suited by a return to longer trip here. FLETCHER'S FLYER is a former Irish point winner who bettered his useful form over hurdles when returning to Ireland to win a competitive handicap at Punchestown a year ago. He has raced only twice since, including a creditable two and a half lengths third to Bigbadjohn in the Reynoldstown Novices' Chase at Ascot last time. Next up there's Gordon Elliott’s NOBLE ENDEAVOR, who beat The Crafty Butcher at Leopardstown before to be sent to the Cheltenham Festival along with the high-hopes of his connections. Anyway, he finished a well-beaten 3rd in the Ultima Handicap Chase. ABOLITIONIST improved after four months off when winning the Leinster National Handicap Chase at Naas last time by one and three-quarter lengths from Folsom Blue. He has an 8 lb penalty here but is clearly in good form and is not one to discount too readily. HAYMOUNT powered up the Cheltenham hill from near the rear of the field to finish third in the National Hunt at Cheltenham Festival last month and he could bid for glory off a favourable weight. FOXROCK has enjoyed plenty of success in hunter chases in his native Ireland this season, winning four consecutive races while seven-year-old ARBRE DE VIE will carry 10-5 and is well-backed although he’s yet to complete a chase over three miles or more. BLESS THE WINGS clearly gets on with Fairyhouse as he has finished first and second here in two starts here. He placed third in the Cross Country at the Cheltenham Festival 2016 and runner-up in this year's edition of the same race. The 12-year-old gets to the race off of only two pounds higher than when second in 2016. MINELLA FORU has only appeared once this season, finishing 4th in a strong Grade 3 behind Sutton Place at Navan. Last season, Edward Harty’s charge finished 2nd in a big handicap here at Fairyhouse, before beating Ucello Conti and Gilgamboa in the Paddy Power Chase Handicap title at the 2015 Leopardstown Christmas Festival. GENERAL PRINCIPLE heads have won his last two in decent fashion and with just 10-5 to carry has plenty in his favour. He has recorded just two win in his 8 chase starts, but have been second three time and third once – meaning he has only been out of the top three twice over fences. SHUTTHEFRONTDOOR won the race in 2014 for Jonjo O'Neill and JP McManus and can't be ruled out in this year's edition after decent perfomances in recent times. ALPHA DES OBEAUX tried to stay with Might Bite in the RSA Chase at Cheltenham but dropped tamely through the field as the pace quickened again going down the Cheltenham hill. LORD SCOUNDREL has ended up with top-weight. He won the Galway Plate last summer and hasn’t run since running third in the Grade 1, won by Valseur Lido, in the north, in November. THUNDER AND ROSES stayed on dourly to win the Irish Grand National in 2015, pulling four lengths clear of Rule The World, who went on to win last year’s Grand National. Has not won since landing that race. Finished a valiant second in a 3m 5f chase at Fairyhouse in December and backed up his claims when second to Pleasant Company in the Bobbjo Chase at the same venue in February. At the recent Aintree Grand National he unseated the ride at the 9th fence. TIGER ROLL won the Munster National Handicap Chase at Limerick by seven lengths from Stellar Notion in October and put two below-par efforts behind him when winning the National Hunt Chase at Cheltenham last time by three lengths from Missed Approach, despite three notable errors. RAZ DE MAREE arrives here a relatively fresh horse having only made it as far as the sixth fence in the National. He was runner-up by just 1 ¾l to Gold Cup third Native River in the Welsh National. Up just 4lbs here he looks solid each way value. ROGUE ANGEL won at Galway, Listowel (Kerry National Handicap Chase) and this race last season but has not been so good this term, possibly amiss when pulled up in the Grand National at Aintree last time out. ROI DES FRANCS has won in lesser company at Down Royal on St Patrick's Day and showed benefit of blinkers. Anyway, seven runs since joining Gordon Elliott this season have produced only one win against modest rivals. He finished 18th at the Grand National at Aintree few weeks ago. WOUNDED WARRIOR pulled up before 29th fence at the AIntree Grand National. He had some good results in 2015, beating 2016 Grand National winner Rule The World and finishing third behind Don Poli in the RSA Chase at Cheltenham two years ago. MEASUREOFMYDREAMS finished third in the four-mile National Hunt Chase at Cheltenham last year behind the 2017 Gold Cup second and third, Minella Rocco and Native River. Pulled up at Gowran in January and gave a lacklustre performance at Cheltenham and at the Grand National, where he unseated his rider at 15th fence. Willie Mullins' SAMBREMONT looks the best of the rest while BONNY KATE (ante-post fav last year), FIRST LIEUTENANT, STELLAR NOTION, BAUE DES ILES and DOUBLE SEVEN can't be ruled out. DEDIGOUT, TELL US MORE, CLARCAM and THE GAME CHANGER has very few chances while OSCAR KNIGHT, ANOTHER HERO and MYSTICAL KNIGHT are reserves at the moment. 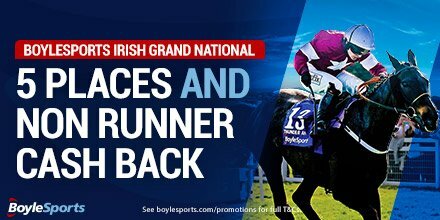 Boylesports offer 1/4 odds 5 places and non runner cash back! "2017 Irish Grand National predictions, betting tips, odds and free bets (Easter Monday - Fairyhouse - 17.4.2017)"